Thus I make my way out to the Saguenay-Lac-St. Jean area for a week-long adventure trip, about a two-hour drive north of Quebec City. Most people don’t typically associate “adventure” with Quebec and, truth be told, I’ve never really heard of Saguenay before. So other than vague but intriguing promises of adventure travel, I don’t really know what to expect. Turns out that Lac St. Jean (Lake Saint-Jean) is a massive brine water lake in the middle of Quebec, fed with ocean water by the impressive Saguenay fjord via the equally magnificent St. Lawrence River. 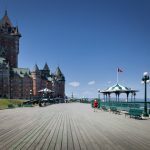 Wait, there’s a fjord in Quebec? Yes! 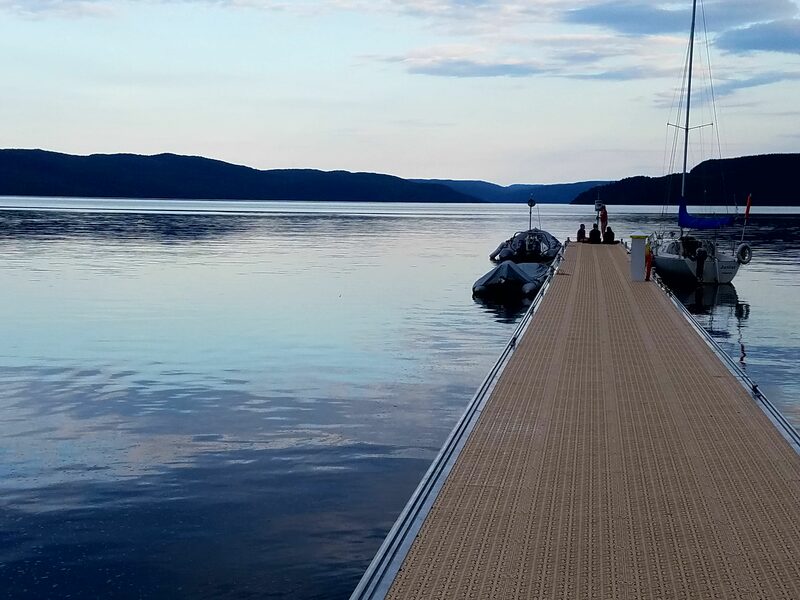 The 100 km (60 miles) long Saguenay is the southernmost fjord in the northern hemisphere. About 12,000 years ago, at the end of the last ice age, a 2-km (1.25 miles!) tall glacier carved its way through the granite rock of the Canadian shield to leave this indelible impression on the earth. At its deepest point, Saguenay plunges to an astonishing depth of 280 meters (930 feet) below sea level. Remember, we are not out at sea here but in the middle of the continent! 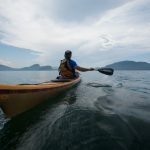 And because the fjord is connected to the Atlantic Ocean through the mighty gulf of St. Lawrence, it is also home to an array of majestic marine animals. It is here that I meet up with my fellow adventurers, Sam, an intrepid kiwi living in New York, and Geoff, making his way out here from Oregon. 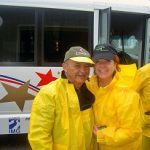 Our knowledgeable local guide is Nancy, who quickly fills us with facts about the region. 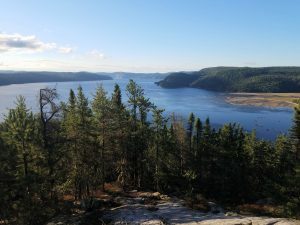 Saguenay is an old native word meaning “where the water comes from” [on that note: the name Canada comes from the Iroquois language and means “village”.] 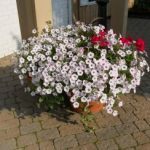 The locals around here are often referred to as The Blueberries, a reference to the abundant, and hardy, blueberry bushes that grow around here. Indeed, hardy is an apt description, as winter temperatures often drop to below -30 °C (-35 °F)! Nancy assures us, the crystal-white frozen snow is a spectacular sight. I’ll take her word for it…. For now, we enjoy the lush green, boreal forests that blanket both sides of the beautiful fjord as far as the eye can see. It must be gorgeous in fall, I imagine. 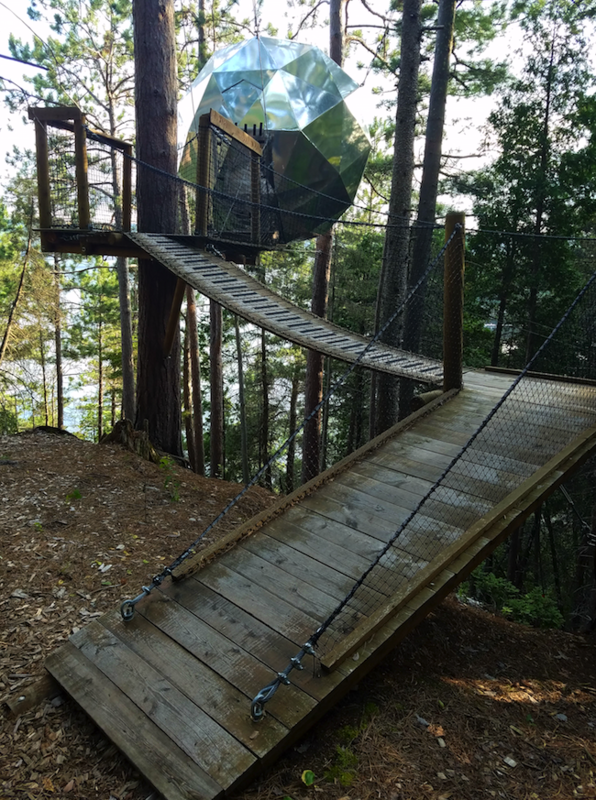 My accommodations: a sphere hanging off a tree over a cliff. 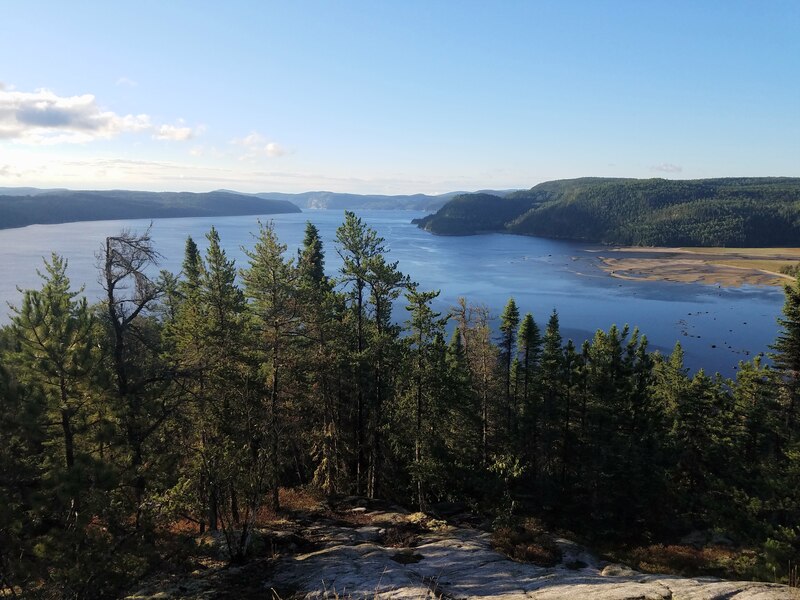 After an hour’s drive to the north side of the Saguenay, we arrive at Parc Aventures Cap Jaseux for the first of a series of nature activities. Parc Aventures is an adventure camp hidden in a forest, laden with family-friendly water and land activities. 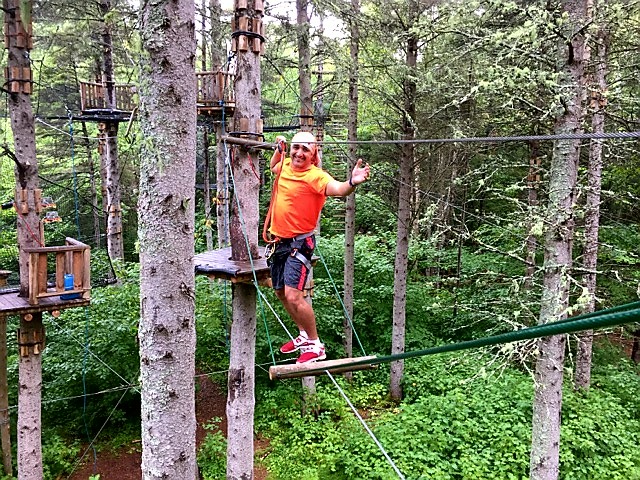 The highlight is a seemingly never-ending treetop obstacle course, four stories up in the canopy of the Saguenay forest. There are courses for people of all skill levels, from young children all the way up to expert climbers. Here’s the rub, Nancy informs us with an impish grin – the park has just added an ‘extreme’ course. And wouldn’t you know it, we get to be the guinea pigs who test it out. Wait, what? I spend the evening pondering tomorrow’s challenge. None of us have ever done this before and we are supposed to attempt the extreme challenge?? I can’t help but wonder if this isn’t some sort of Canadian hazing scheme on unwitting Americans? My accommodation for the night is a custom-built, metallic sphere hanging off a tree over a cliff. It’s almost as though an alien ship has arrived, but is not quite ready to land yet as it hovers above the ground, pondering whether these earthlings are worth it. I reluctantly climb in, the narrow footbridge beneath me swaying and bouncing over the cliff. A nice preview of tomorrow, I suppose. Inside, I find the sphere quite welcoming and cozy. I zip up the mosquito net but leave the door open to enjoy the serene silence of the Saguenay at night. A carpet of stars twinkles overhead. What better way to fade away to sleep. 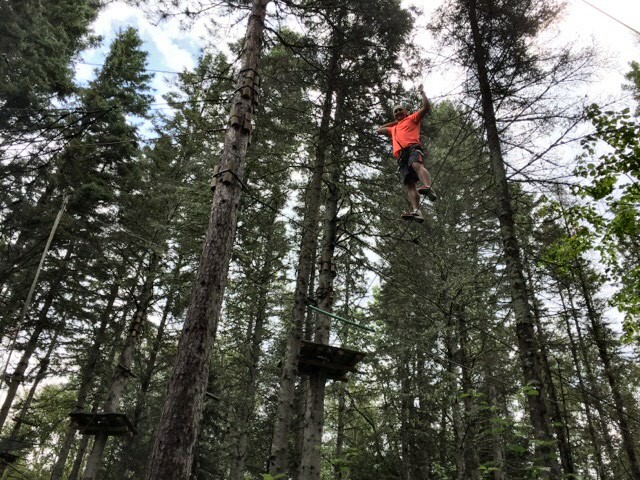 Turns out that four stories feels a lot higher when you are balancing on a thin cable with nothing between you and the ground other than a few branches. Of course, I’m tied in to my safety carabiner and the guide swears, if we slip, we will only fall about 2 meters. That doesn’t really assure me, as I wonder if I should have written my final Will and Testament before I climbed up. I have always suffered from a mild fear of heights so I plan to follow that age-old adage “Just don’t look down.” But how will I see where to step on the cable if I don’t look down? Damn, so much for that. 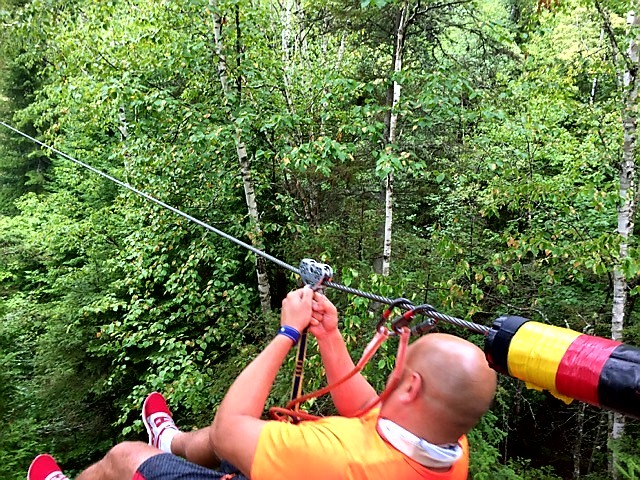 I gingerly put one foot on the cable, followed, even more cautiously, by the other. The cable seems stable, even as it sways gently through the canopy of green branches. A cool breeze gently blows through the treetops and a fine sprinkle of rain dampens my face. In the distance, thunder can be heard. 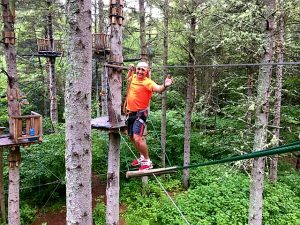 I focus on the maze of diverse obstacles I encounter, jumping from one plank to another, swinging across cables, climbing up tall poles, or simply balancing free-handed over the treetops. Did I mention I have a mild fear of heights? On several occasions, I feel the faint grip of fear-driven paralysis, but each time, I manage to calm my nerves and continue on. Each new obstacle seems more complex than the previous one. Conversely, I also become more confident with each success. Eventually, balancing on the cable seems almost natural. Almost – as I am reminded when I get too cocky and nearly slip off at one point. Focus, dude. Focus. We’re having a blast until, after about 90-minutes of climbing and balancing, our guide informs us that we are only halfway through the course. Really? My arms already feel like mush. This is a tough work out, even though I’m in decent shape. I wonder how I’m going to finish the second half. 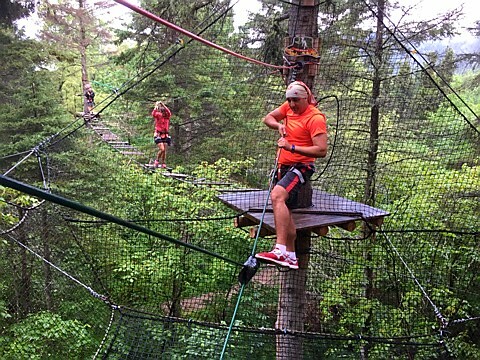 Eventually, we get to the Tarzan challenge – grab a thick rope, jump off the platform and swing across the forest to grab a fishing net hanging on the other side. One by one, we step up to the edge of the platform but back out of the challenge. We are physically exhausted and cannot fathom how we can hold on to a rope, much less grab on to anything on the other end of the swing. Am I disappointed not to be able to finish the course? Kind of. Do I feel like I failed? Definitely not! Sam and Geoff share my sentiments. We started on the ‘extreme’ course with absolutely no experience and managed to make it more than halfway. If anything, it’s just more reason to come back here and give it another shot. On the way back, we are treated to one last surprise. A treetop zip line awaits us to take us all the way back to the camp. This certainly beats walking back. Whoever thought of that was genius. Back at the camp, Nancy greets us with hot food and a warm smile. She looks on in mild amusement as we greedily devour our sandwiches. 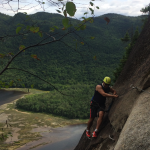 While I’m not sure what our next adventure is, I am already pleased with my decision to give the Saguenay region a chance. I can’t wait for the next stop…! 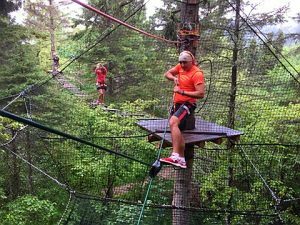 Parc Aventures Cap Jaseux is an adventure camp on the north side of the Saguenay fjord, an easy 30-minute drive from Saguenay.